Masking film is a sheet of plastic with light adhesive on one side. It is a wonderful tool for stencilling or creating resists for your painting projects. 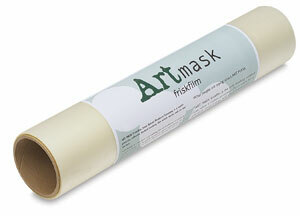 Most frisket films will adhere to most porous surfaces and are ideal for gesso'd canvas. The smoother your surface - the cleaner your edge will be. Many artists use masking film in their process when they are using a drawing on the surface they are painting. For example, the artist will either transfer or draw out their image on their painting surface and cut masks to cover the drawing details so that they can paint around it creating smooth areas of colour - often for the background. When the paint is dry the artist can remove the masking film to reveal the detailed drawing beneath which can then continue to act as a detailed guide for the painting. Many airbrush artists use masking film to reduce over spray and create sharp, clean edges in their work. 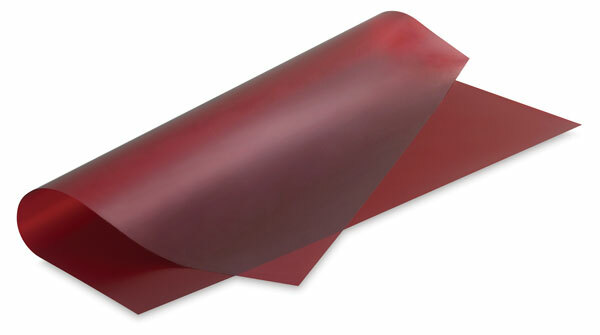 Rubylith (pictured below) is a delux sort of masking film, made unique by the characteristic property of two layers of film instead of one. One layer of the film is usually colored and can be peeled off the second clear film to which it is lightly adhered. This masking film is translucent - you can put it on top of your drawing or painting and trace out the shapes that you wish to mask directly onto the film with a sharpie. From there you can cut through the film to create a sticker of the area you would like to mask in the painting. Rubylith has many uses and it is commonly used for photosensitive silkscreening techniques which you can learn more about here. Apart from getting really technical with masking film you can utilize it in a more spontaneous way - cutting random shapes and using them as resists. There are many ways to explore this interesting tool!